A reflection for the 5th Sunday of Lent, Year A. The readings are Ezekiel 37:12-14; Psalm: 130; Romans 8:8-11 and John 11:1-45. I’ve heard and read the story of the raising of Lazarus so many times and I usually focus on the end; on the actual raising of Lazarus. This is Jesus’ last of seven miracles in the Gospel of John —John calls them “signs”— This is the miracle of miracles. Walking on water? Multiplying bread and fish? Turning water into wine? Healing the sick? But no one had ever heard of a dead man coming back to life. This is the miracle that got Jesus killed. After this miracle is when the chief priests had that meeting and decided that it was better for one man to die than for a whole nation to perish and they began plotting to kill him (John 11:45-53) – and not only him but also Lazarus (John 12:9-11). But there is so much in this Gospel reading. I’d like to focus today on what Jesus says to Martha: “I am the Resurrection and the Life. Do you believe this?” ‘Cause I don’t think we do. I AM is the name of God. When God appears to Moses in the burning bush and sends him to Pharaoh, in Egypt to free the Israelites, Moses asks, “who should I say sent me?” God said, “Tell them that I AM sent you” (Exodus 3:14). This is the sacred name of God that no one would pronounce. But Jesus says, “I AM”. He is saying that He is God. (This is another reason why He gets killed –the Jews knew exactly what He meant). He is the God that fulfills our every need. He satisfies all our deepest longings. If you are in darkness, HE is the Light of the World. If you are hungry, HE is the Bread of Life; if you’re lost, HE is the Way and the Truth; if you need protection, HE is the Gate; if you need care and guidance; HE is the Good Shepherd; if you feel disconnected, HE is the True Vine. And for all those little parts of your life that are dead, dead because of addiction or abuse; dead because of pain or hopelessness; because of laziness, apathy and complacency, dead because of fear or doubt; dead because of isolation or separation, because of weakness and sin, HE is the Resurrection and the life! Do you believe this? Because it doesn’t seem that Martha and Mary quite believe it. Mary just says, “had you been here, my brother Lazarus would not have died.” And when Jesus actually tells Martha, “I AM the Resurrection and the Life, do you believe this?” she doesn’t say, “Yes I believe that you are the Resurrection and the Life”, instead she only says, “Yes, I have come to believe that you are the Messiah.” And when Jesus asks them to remove the stone and open the grave, Martha is not thinking that Jesus is the Resurrection and the Life, she’s thinking about the bad smell. Do you believe that Jesus is the Resurrection and the Life or are you only thinking about the bad smell? Do you believe that God is a God of Life and He has always been a God of Life and will always be a God of Life? That’s why in the Book of Ezekiel God can say that He is going to open graves and breathe life into dry bones (Ezekiel 37: 1-14). Do you believe that God will open your grave and breathe life into your dry bones? And that’s why St. Paul tells the Romans that the Spirit will bring their mortal bodies to life. It’s the Spirit that gives Life. Do you believe this? The Spirit gives life; not going to the gym or eating organic food or chia seeds – that’s clinging to this life; God is Life; eternal life. Jesus says, “I came to bring you Life and that you would have it abundantly.” Don’t you want to have abundant life? Do you believe that Jesus can and will make all things new? Not some things, but ALL things. Not some times, but always. Not one day in the future, but today. Do you believe this? Do you believe that He is the Way to Eternal Life? 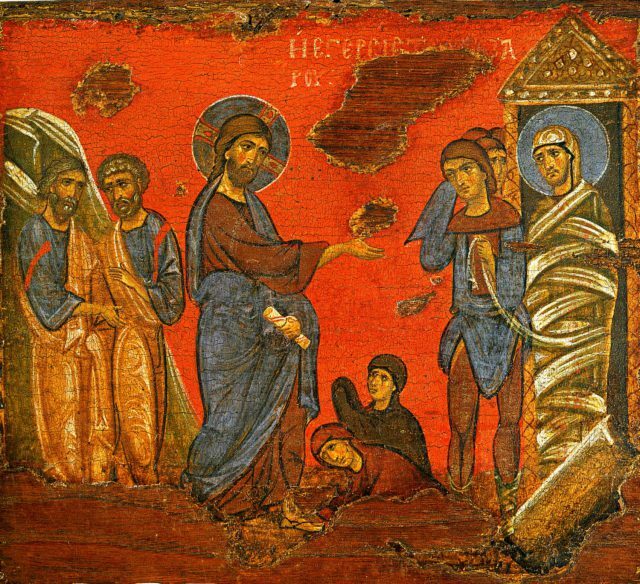 Our hope is not be Lazarus who is brought back to this life or to be people who never die – as Martha and Mary wished Jesus would have prevented Lazarus from dying– that’s clinging to this life. Our hope is to die into life eternal; everlasting life; abundant life– in Heaven. Do you believe that Jesus is the Resurrection and the Life? Do you believe that He makes all things new? Because He wants to call you forth. Come out from the darkness. He wants to untie you and set you free. « I Am With You, Always!